• What are the non-surgical treatment options? • Can a natural hairline be achieved? • How do I contact Dr. Keene? • How many grafts would I need? • How do I ask Dr. Keene a question? • What is Dr. Keene’s background? • What are the pre and post op instructions? • How does strip compare to FUE? • What is the Norwood Scale? • Who actually performs the transplant? • What techniques are used? • How long before I see results? • Does Dr. Keene use lateral slits? • Are you a candidate for a hair transplant? • What size blade is used? • What are Dr. Keene’s credentials? • How do modern techniques compare to old style plugs? • Do you have pictures of results? • What is a graft? • What if I’m losing my eyebrows? Q.: What causes hair loss? In order to successfully treat hair loss, it is essential to understand it. Androgenetic Alopecia, often referred to as male pattern hair loss, can occur in either men or women. In male and female pattern hair loss, baldness occurs when hair follicles in the front of the scalp, crown or both areas are genetically programmed to stop producing hair in response to dihydrotestosterone (a by product of testosterone). The gene that makes this happen can come from either parent, and frequently the hair loss pattern is similar among extended family members. Only the follicle is affected; the scalp itself is generally completely healthy. Androgenetic alopecia can occur in both men and women, but the patterns tend to be different. Here, the Norwood-Hamilton Scale shows common patterns of male pattern baldness. Q.: What are the medication treatment options? Will Propecia or Rogaine produce the same results? In late 1997 the FDA approved the drug finasteride to fight androgenetic alopecia (male pattern baldness) in men. Finasteride is the generic name of the drug (developed by Merck) which is marketed in a 1mg dose as Propecia, and a 5mg dose as Proscar. A single milligram is all that is necessary to achieve and maintain the hair stabilization or regrowth benefits of this medication. The 5mg dose of Finasteride (Proscar) is effective in treating some cases of enlargement of the prostate gland. Although the dose is different, these medications are the same. The medication works by blocking the enzyme that converts the male hormone Testosterone into its metabolic byproduct, Dihydrotesterone (DHT). In the case of male pattern baldness, DHT is apparently the messenger hormone that directs the hair follicle to stop making hair. Therefore, blocking the formation of DHT has been found to help stabilize hair loss and to regrow some hair in affected men. Although DHT is felt to be important in a developing male fetus, researchers do not feel it maintains any important beneficial functions in adult males. The results of two year medical trials studying the effects of Propecia in male pattern baldness revealed a greater than 83% response rate in study participants who either maintained their hair pattern and stopped losing hair, or 66% regrew an average of 10% more hair in an area of thinning hair. The medication was not felt to be effective for certain patterns such as temporal recession (hairline). It would not be expected to regrow hair in an area where an absolute loss of follicles had previously occurred. In addition to Propecia, the only other FDA approved medication treatment for treating hair loss is Rogaine (or any generic of Minoxidil). For more information regarding Minoxidil and recent studies, click here Minoxidil Studies. 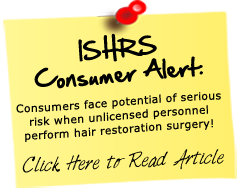 Q.: What are the Pre and Post Hair Transplant Surgery Instructions? Since we use only local anesthesia, our patients are encouraged to eat a normal breakfast. The scalp has an excellent blood supply, so efforts to minimize bleeding help shorten the hair transplant procedure time and decrease the risk of bruising or swelling after the hair transplant surgery. Avoid medications or vitamins which can prolong bleeding. Some of the medications that can prolong bleeding include: Aspirin and Aspirin containing cold and flu medications, NSAIDS such as Ibuprofen, Ketoprofen, Advil and Aleve. If you require NSAIDS for arthritis, new medications are available which do not cause bleeding. Please feel free to call for more information. The first three days after surgery require the greatest care and caution while the grafts are healing in place. Activity should be limited to walking and sedentary activities. Strenuous and all normal activities can be resumed 1 week after surgery. For some patients it is possible to return to work in only 3-4 days. Others prefer to wait an entire week when most incisions are totally healed and sutures from the donor area can be removed. Postoperative graft care involves gentle misting of the area with saline. Other than the elimination of certain activities, there is very little extraordinary care required. Most of the healing is automatic and depends on your unique rate of healing. Medication: Three medications have been prescribed for you. It is advisable to take medications with food to prevent nausea. Take the medications spaced a minimum of 30 minutes apart. These medications are helpful, but not mandatory. If they make you feel sick or upset your stomach, you may stop them at any time. • PREDNISONE: This medication will help prevent swelling. • ANTIBIOTIC: An antibiotic such as cefzil will be prescribed as a precaution against a very low risk of infection. One single dose taken in the morning of the day of surgery together with your breakfast is sufficient. • PAIN RELIEVER: A mild narcotic-analgesic such as Hydrocodone (Vicodin) will be prescribed to help alleviate any pain that you might experience. This medication is optional after the first 24 hours. Generally, you will experience little or no pain at the graft sites. Some minor discomfort is common the first day or two after surgery, but is usually well controlled by a mild narcotic-analgesic. This medication can cause drowsiness. Do not consume alcohol while you are taking this medication. Exceptions will apply–allergies to the above medications or other contra indications will result in a change in medications. Do NOT use Rogaine (minoxidil) for 7 days following surgery or until the scabs are gone and the incisions are completely healed! This will prevent over-absorption of medication. However, once the incisions are healed, topical Minoxidil can help speed graft growth if used for at least 3 months after surgery. At that time you should wean yourself gradually off the medication. It is recommended that you limit your normal activity during the hair transplant healing phase, but most normal activity can be resumed one week after surgery. It is recommended that you avoid activities that will exert excessive pulling on the back of the scalp for a few months as the donor incision can stretch if excessive tension is applied. Examples would be weight lifting exercise for your neck, deliberatiely working on stretching the area by bending your head forward, and massaging the area. Q.: What is the cost? Prices range from $5 to $3 per graft for FUT on an incremental basis, depending on graft numbers and from $7 to $3.50 per graft on an incremental basis for FUE. We include a $500 travel discount for out of state patients. Q.: Are you a candidate for a hair transplant? There are three main factors we consider in determining a good candidate for hair transplant surgery: current hair loss pattern, health, and future hair loss. Women may have other factors to consider, so refer here for recommendations for women. Hair color – Lighter hair (decrease in contrast) requires fewer grafts than darker hair (increased contrast). Hair caliber – Straight or curly hair – curly hair covers more effectively than straight. The following are a range of follicular unit grafts necessary to achieve density. This is based on follicular units, not individual hairs. One haired grafts do not yield the same results. More one haired grafts per square centimeter are required than the follicular units of 2-4 hairs, so the numbers below only give you a vague estimate. Dr. Keene will give you an estimate using the minimum numbers of grafts you should have to achieve a density that will make a significant aesthetic difference, and up to the amount she considers safe for you based on your future hairloss, laxity, budget, and other factors. For ex., with limited donor availability in one surgery, depending on our hairloss pattern, you may prefer to focus density in your frontal area, and still want thinning coverage in the crown area. Thin: 20 grafts per square cm on average – provides contour and thinning coverage, see through in certain lighting. Moderate: 25 – 30 grafts per square cm on average – moderate coverage and contour. Keep in mind that the numbers of hairs per graft impacts the density of the procedure. For example, fifteen 3-4 haired grafts (yielding 45-60 hairs) will produce as much or more hair density as thirty 1-2 haired grafts (yielding 30-60 hairs) , and thirty 3-4 haired grafts (yielding 90-120 hairs) will produce as much or more density as 60 1-2 haired grafts (yielding 60-120 hairs). Dr. Keene focuses on 3-4 haired grafts as much as possible, but the ability to achieve the higher numbers of hairs per graft varies between patients. Greater numbers of grafts per sq cm are needed if more 1 to 2 haired grafts are used. *During your hair transplant consultation, Dr. Keene will help you determine what density is necessary to achieve your goals. Who will actually be performing my hair transplant procedure? Dr. Keene is the only person who will make any excisions or incisions on her patient. She supervises every aspect of the hair transplant surgery, utilizing assistants to assist in hair transplant surgery, not perform it. Dr. Keene has an experienced and skilled surgical team with extensive hair transplant training, some of whom have been assisting her in hair transplants for over a decade. However, she feels that if it were herself or a family member, she would want the medical doctor to actively participate in all of the vital aspects of the surgery, including placement of the grafts, regardless of the fact that the staff is skilled–so this is what she does in her clinic. Dr. Keene’s technicians are some of the most experienced and skilled technicians in the hair transplant industry, but she will be the primary person doing your hair transplant. Part of the reason you rarely see Dr. Keene blogging is because she spends so much time in surgery. She will perform all aspects of the surgery, with assistance from her experienced hair technicians. How soon after hair transplant surgery will I see the new growth? When hair is surgically moved from the back of the head and redistributed into the areas of hair loss, the transplanted hair experiences trauma. This typically causes what is referred to as shock loss, causing the shaft of the hair to fall out in about 1 to 6 weeks after surgery, while the root remains behind. The newly growing hair will begin to gradually emerge in about 3 months after surgery, depending on your rate of growth. By 6 months you will se significant regrowth, but it will usually be finer in caliber. The hair continues to mature and add density for up to a year. There can be exceptions to shock loss, but it is best to expect it to occur. Sometimes the trauma can result in shock loss of some of the native hair (i.e. hair we did not transplant) but it is expected to grow back unless it was about to fall out due to genetics. And, genetics can be combated with the use of finasteride. Dr. Keene is very careful to avoid transecting any existing hairs when she transplants hairs in between them, but trauma occurs with any incision and any surgery. So while the risk is minimized for temporary shock loss, it may still occur–so don’t panic if it happens! It will typically start to grow back within a few months. This transitional phase after surgery is the hardest part, but the wait is worth the results.